Somehow our own Suberb-fetishist Mr. Hardigree missed the unveil of the wagon version of VW's most Czech of brands. 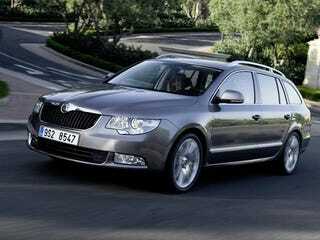 The Skoda Superb Estate offers all the features of the sedan with the added cargo room of a wagon, surprise! Like the sedan and hatchback, the Superb Estate comes in S, SE and Elegance models, gets your choice of gas or diesel engines, a manual transmission or a DSG. The rear hatch has a power open option with load and road illumination as well as a detachable flashlight built right in. As always, there's no chance of this latest Euro-wagon hitting US shores. The new Škoda Superb Estate is set to become both the most luxurious and most practical car ever to wear the famous winged arrow badge. Trim levels and engine choices will mirror those of the Superb hatchback with S, SE and Elegance models available along with the same range of three petrol and three diesel engines. All engines, from 1.4 TSI to 3.6 V6 are equipped with direct fuel injection for optimum fuel efficiency, performance and low emissions. With a choice of manual or twin-clutch DSG gearboxes linked to either two- or four-wheel drive, there's a Superb Estate to suit everyone's needs. Not to be outdone by the hatchback's innovative Twin Door tailgate, the Superb Estate's boot – the biggest in its class – has its fair share of neat touches too. All models are fitted with a pair of lights built into the tailgate to illuminate not only the load bay but also the area around the rear of the car. A third, LED light in the boot can be removed all together and used as a torch and, thanks to its magnetic body, mounted to the car's body. The tailgate itself has an optional power-operated function while the integrated luggage cover automatically retracts when the boot is opened. Customers can also specify the variable floor which extends over the rear bumper to help with awkward loads. Those who choose SE or Elegance will further benefit from a load partition and tethering system provided in the boot as standard. And if the Superb Estate's cavernous load bay (633 litres with the rear seats in place, 1,865 litres seats down) still isn't big enough, all models are fitted with roof rails as standard. (Black roof rails on S and chrome roof rails on SE and Elegance). To make life even easier, an optional keyless entry and starting system (KESSY) is available for the first time on a Škoda, while passengers in all five of the Superb Estate's spacious seats will enjoy the natural light offered by the new two-piece electric panoramic sunroof. The Superb Estate will carry a premium over the hatchback of between £1,150 and £1,350 when it goes on sale in the UK in February. The estate is expected to account for a third of all Superb sales in 2010, of which fleet sales are expected to make up approximately 75 per cent.